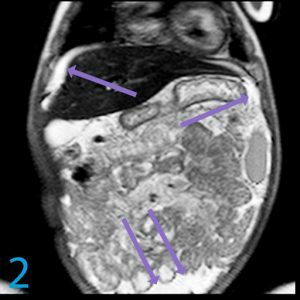 What is causing this infant’s liver lesion? Intrahepatic vascular shunt with predominant feeding from the main hepatic artery. Bidirectional flow in the right portal vein supports arterioportal malformation. Arterialized flow within the hepatic veins noted, sequela of venous hypertension. Main portal flow at the liver hilum is not demonstrated (flow reversal was demonstrated on the earlier ultrasound). Antegrade flow of the left portal vein is recorded. You should consider dedicated hepatic arteriogram. Patent splenic artery and vein found at the hilum. What is causing his lesion, and what are some other causes of vascular liver lesions in children? This particular lesion is caused by the aforementioned aorto-portal malformation within the right lobe of the liver with early retrograde venous reflux into the portal vein and SMV branches. 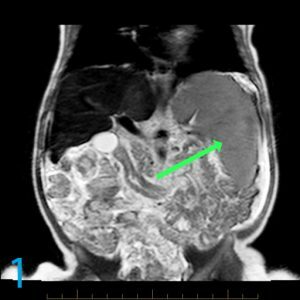 Take note of the splenomegaly (green arrow, image 1) and diffuse ascites (purple arrows, image 2) as well. 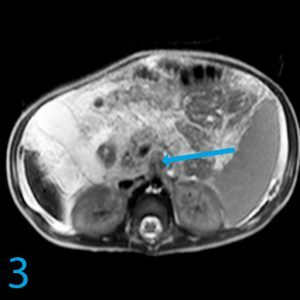 An enlarged celiac trunk (image 3, blue arrow) is a key to the diagnosis. Image 4 shows the hepatic hypervascular lesion (pink arrow). 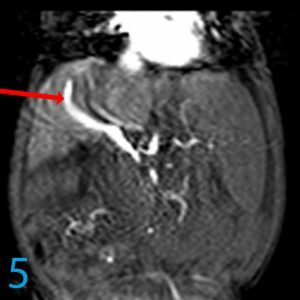 Image 5 is a raw data slice from an MR angiogram showing a dilated portal channel (red arrow) with confirmed sonographic hepatofugal flow. 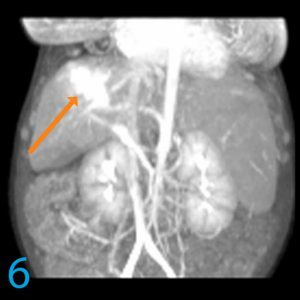 The MR angiogram in image 6 shows the vascular liver lesion (orange arrow) and image 7 shows the enlarged celiohepatic artery feeder (yellow arrows). Aortic tapering is commonly seen with high-flow vascular malformations, more commonly with multiple hemangiomas, which can be associated with Kasabach-Merritt syndrome and platelet sequestration. Liver AVMs may be seen in Osler-Weber-Rendu (OWR) syndrome or hereditary hemorrhagic telangiectasia. Large lesions can cause high-output cardiac failure. 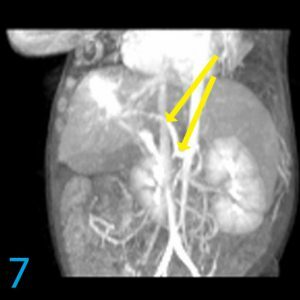 However, hepatic artertial to portal connections may lead to portal hypertension as in this case. AVMs in the liver and especially the lungs have the greatest specificity for underlying genetic syndromes like OWR. OWR is inherited as autosomal dominant. 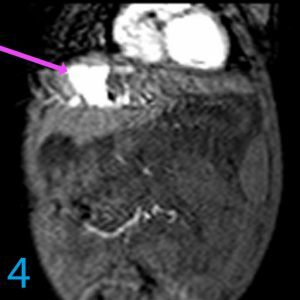 For more case review, check out MRI Online.